Here we have our Thanksgiving Mickey pumpkin or Halloween boy's shirt, John John, longall or shirt and trousers outfit. The John John/longall are made with either brown or black gingham. 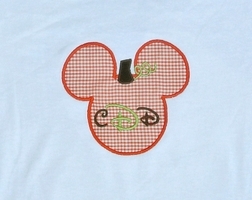 The shirt, John John and longall are appliqued with your choice of Mickey pumpkin or as a Jack-O-Lantern. 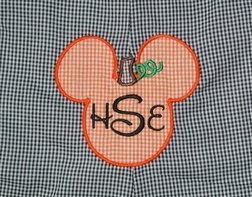 The plain pumpkin applique includes the monogram. The shoulders of the 1 piece outfits fasten with orange buttons. You can also choose to pair black or brown gingham trousers with the shirt. 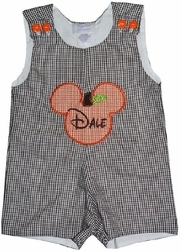 Perfect for a trip to Disney World or Disneyland all throughout the fall season or fall Disney birthday parties. Please note: sizes 5 - 6x/7 are only available in the shirt/shirt and trousers options.